I got the bike on sunday! It's pretty complete, but in dire need of restoration. The brakes haven't been used in a looooong time. It has front and rear discs, so I get to deal with two hydraulic systems. 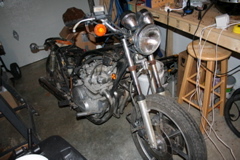 The motor has good compression, so I'm going to restore the rest of the bike and get it running before starting the conversion. My time is pretty limited for a while, so it's a good compromise. It's also far, far easier to get it licensed and inspected with the original hardware. For now I'll post updates as they come along. I almost picked up a 6.7" Advanced DC motor off ebay. I didn't bid too aggressively because I wasn't sure I really wanted it. I think there are two choices for motor. The briggs and stratton Etek motor - chinese made, usually about $500. I'm leaning towards a Perm 132. It's the same technology as the Etek, but german made and bigger and better. It costs a bit more, but it's the heart of the machine. at 48v: 15.1 peak hp, 86% efficency. at 72v: 34.2 peak HP, 88.6% efficiency.